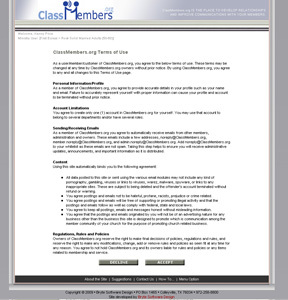 What pages are included in the ClassMembers.org site? Some pages may or may not be appropriate for a department, so there is a function allowing the Department Administrator to select the pages that he/she feels are appropriate for the department. There are also several pages which may be modified to contain any content appropriate to your department. The following is a brief overview and thumbnail photo of each of the pages currently in the site. 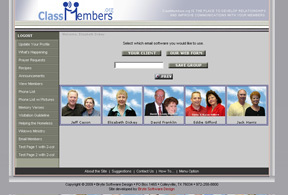 Every member and administrator has the opportunity to update his/her personal information on the Member Profile page. The data from this page is used to create several other pages within the site including the View Members Page, the Address List Page, and the Email and Text Blast Page(s). From this page, each member can view the various roles assigned to him/her and the photo associated with each role. Birthdays - on pages where the birthday is displayed only the month and day will appear. On this page it has a complete date If a person doesn't want to enter a year that's OK. We are only interested in when you celebrate this important date in your life, not in how many times you have celebrated it. Sensitive Information - If you feel uncomfortable sharing any of your information with others in your department, do not include it on this page. None of the information is required. 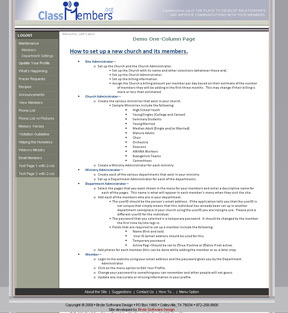 Church Directory - There will be a church-wide directory made available to all members from your church. The only information which will be shared with people outside your department will be your name, home phone number and city where you live. People will be allowed to contact you via email through this site but we will not disclose your email address. We will never share any of your information with anyone. We will not knowingly allow any of your information to be shared outside your church. Nothing but your picture, your name, your home phone number and your city of residence will be shared with people within your church but outside your department. Every member and administrator is allowed to update the informaton on the Department Calendar. A member can add an item to the calendar (Just click "ADD"). The new information is posted to the calendar as soon as you click "SUBMIT". A member can also update/delete any item he/she placed on the calendar. The Department Administraor(s) can update any item on the calendar regardless of who placed it there. One member cannot update an item placed on the calendar by another member unless he/she is an administrator. The Calendar always shows the current month plus the next two months. Each of the events will show only the name of the event. To see more information about the event, click on the event name and it will take you to the Calendar Event Page. 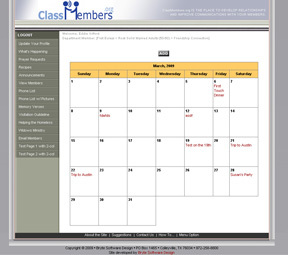 This page is presented when a member clicks on any event shown on the Department Calendar. If the event is one which was added by this member or if the member is an administrator, the event will appear in edit mode and that member will have the opportunity to change and/or delete the event. In addition to the Event Name and date, this page will show the time, location and a longer description of the event than will appear on the monthly calendar. If you are allowed to edit/delete an item, there will be a small trash can icon at the bottom of the page. This is used to delete the item. This is the Department Recipe List page. When the group gets together it is inevitable that there will be food and that some person will bring a dish for which the other members will just have to have the recipe. Now there is a place to share these yummy delights. This page will list the name of the recipe and the name of the chef. To view the recipe, click on the recipe name. To add a new recipe to the site, simply click the "ADD" button and add your recipe. It will appear in the alphabetical list as soon as it is submitted. Any member may add recipes to the site. 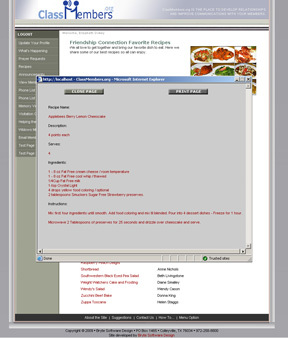 A member may edit or delete his/her own recipes. 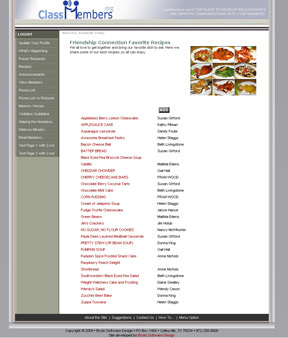 Only the Department Administrator(s) may edit recipes added by any other member. When viewing the list of recipes, if you want more information about a certain dish, click on the name of the recipe and this page will appear. This will show the ingredients and detail instructions for making what may become your favorite dish. The Department Administrator may add Announcements to this page as necessary. Announcements will normally be about events that are about to happen in your department. Other departments will not be permitted to see the announcements from your department. You will not be allowed to see announcements from other departments. There will be a church-wide announcement page where the Church Administrator(s) or Ministry Administrator(s) may post announcements that are seen by multiple departments. When an announcement is added to the site, each active member will receive an email alerting them of the new announcement. If you are a member and need to have an announcement added to the site, please contact your Department Administrator. This is the page where you can begin to get to know each of the members in your department. 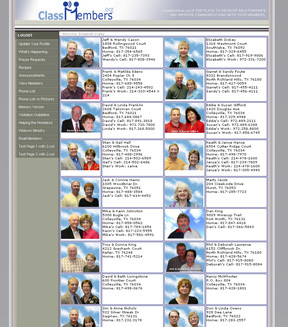 This page will show each of the members in alphabetical order along with their photos and names. To see more information about a member simply click on the member's photo and you will see the information from the member's profile page. At the top of the page there is a place where you can elect to view only those members who are Active, those who are Inactive, or all the members. From this page you can learn even more about the members in your department. This page will show the information from the member's profile that the member has decided to share with the department. There is also a link where you can send the member(s) an email. In case you want to send Christmas Cards or other greetings to each of the members in your department, this is the Address List you can use to do just that. Please treat this information the same way you would like your own address information treated. It is not to be distributed to persons outside your department. This is another version of the Address List (including photos) that you can use to send mail to members of your department. Unless your department is one of those where every member has already memorized the entire Bible, you may want to challenge your members to learn more scripture. This page will help. It is the Memory Verse Page. The Department Administrator may enter new verses on this page on a periodic basis. The new verse will be emailed to each of the active members in the department and it will be posted to this page. How you administer the test as to who has learned the scripture is up to you. Prayer Requests are a vital part of every department. Here is a page where members may all submit Prayer Requests and they will immediately be posted to the page and sent out via email to all active members. Members may update any prayer request they enter. Administrators may update any prayer request regardless of who enters it. Members may not update prayer requests submitted by other members. Prayer Requests will stay active on the site for 2 months from the date entered. This handy one-page list of prayer requests is to put in your Bible or wherever it will be handy for your prayer time. 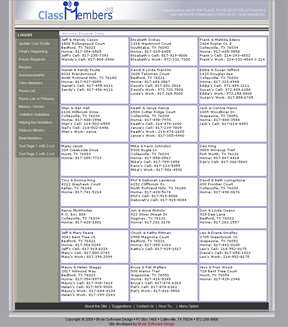 It lists all the active prayer request in an abbreviated form - sorted by category (e.g. Praise, Salvation, Closer Walk, Medical, Jobs, etc.) and sorted by the name of the person or thing to pray for within category. There are some fields when entering a prayer request that state they are for the one-page report. This is that one-page report. When it is necessary to send emails or text messages to certain members - or to the entire department - there is no easier and more accurate way than to use Email Blast or Text Blast (two separate menu choices). 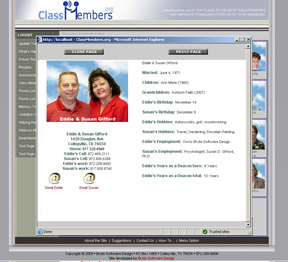 Simply click on each of the members you want to include in the email or text message or use one of your pre-defined email lists to select those members to whom you need to communicate. 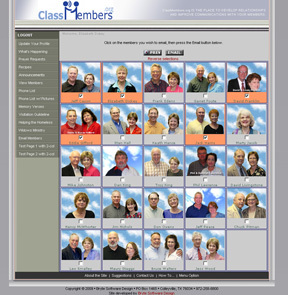 As you select a member, they will be highlighted to let you know who has been selected. When you press the "EMAIL" or "TEXT" button you will go to a confirmation page where you have three choices. These are described below. YOUR CLIENT - Use this option if you are using an email client such as Outlook or Outlook Express and want to send the email using your email client. Note: This option will not appear if you have selected more than 45 members because most email servers will consider the email spam if it is sent to too many recipients. 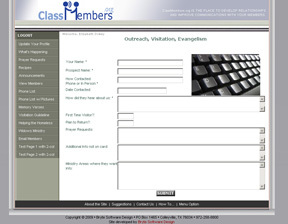 If you have a large number of recipients use our web form. It will send one email to each family - reducing the number of recipients on each email to no more than two. OUR WEB FORM - This option will bring up another page where you may type your email message and include an attachment if desired. It will send one email to each family, thereby reducing the number of recipients on any single email. Note: If you use our web form, the subject of the email will be "Member Email from Fred & Wilma Flintstone" Where Fred & Wilma Flintstone will be replaced with your name(s). SAVE GROUP - If this is a group you will be sending email to on a regular basis, type in a group name and save the group. 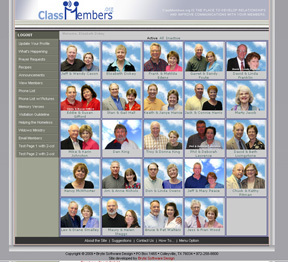 Next time you come to the Email page, simply select that Group at the top left corner of the page. You may create as many groups as you need. If you use hotmail, yahoo, msn, gmail or any of the other free webmail services you have a couple of choices. You may select "OUR WEB FORM" where it will show the list of email recipients to whom the email will be sent. You can continue to use the Web Form and it will send one email to each family as described above or you can copy the list of email addresses and paste them into the "TO" line of your email service. This is more work, but it can be done. This is where the site begins to become unique to your department. You have several pages which you can use for any purpose you wish. This is one of those pages. Using the Department Settings page you may name the page anything you want in your department's menu. Then, as the Department Administrator you may edit the page with any content you desire. Check out the training menu item to learn how to insert tables, lists, and how to edit content in these pages. We will show a few examples on this page just to give some ideas of how they might be used. This one is used by one department as "Satchels for the Homeless" where they prepare backpacks for homeless people. This is a reminder of the types of items to include in the backpacks and a few reminders of what to not include. Although this started as a 1-column page, it includes a three table column to make it appear as a three-column page. 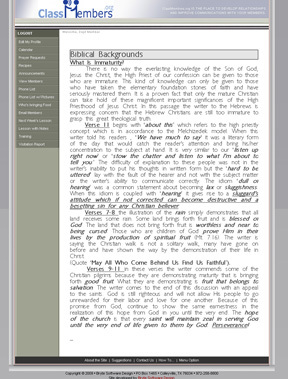 This page is used by some departments to distribute next Sunday's lesson plan. It is emailed to the Department Admin as a Word Document. The Department Admin simply copies it from the Word Document and Pastes it into this page for all to see. The Word formatting is maintained by the page. Tip: If you want a page for the Lesson text with a column for notes you can either use one of the two-column extra pages or you can change your paragraph margins in Word. Make a right margin of about 2.25" in Word. When you copy the text and paste it into this page it will maintain that margin to the right or left - whichever you selected. If you want to display a page in outline form it is probably easier to create the outline in Word and then copy and paste into the page. This is what it can look like. Similar to the 1-Column Extra Pages are the 2-Column Extra pages. I'll bet you've already guessed the difference. Hard to get one past sharp people like you. You are right. This page has two columns with a vertical line dividing the columns. You can put any data you wish on either side - even tables in either or both sides. Here are some examples of how others are using the two-column extra pages. Widows Ministry - This page describes the Purpose, Preparing and Parts of a Widows visit (for one of our deacon groups). 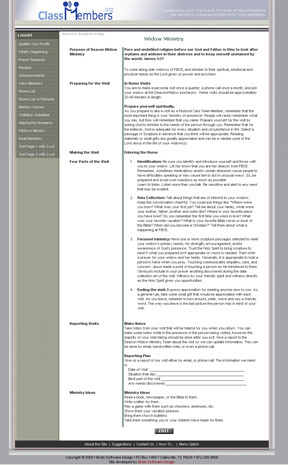 It has several section headings down the left side with information about that section included on the right side. 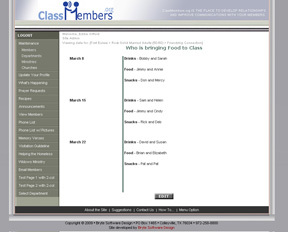 Who's Bringing Food to Class (and when) - This page may be one of the most important in all the site. It let's everyone know who is bringing the food to class next Sunday - and the Sunday after that, etc. You'll never forget when it is your turn because others will remind you the week before. Tip: When you post information to a page such as this - where people are expected to do something on a certain date - please let the people know who to contact if they can't make their assigned time. Members cannot post information to this page - only Department Administrators. If a member has been assigned this month to visit, his/her name and home city will appear at the bottom of this page as a gentle reminder it is their turn to visit. 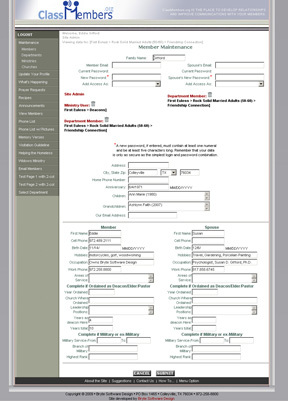 The Visitation Reporting Form is to help get the results of visitation back to the church. The form, when completed, will be sent via email to those persons indicated by the Department Admin on the Department Settings Page. This form will help get uniform and accurate information back to those persons who need it after a prospect or new member has been visited. This page has been mentioned several times already. It is used by the Department Admin to let the application know which pages should and should not be included in the menu for his/her department. It also let's the Department Admin name those pages that are included any way that makes sense to you and your people. 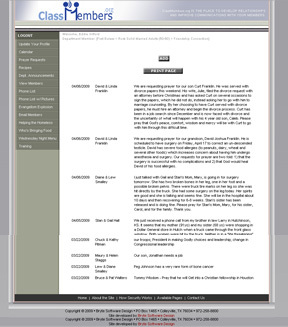 Down the left side is a list of those pages which are included in the site. 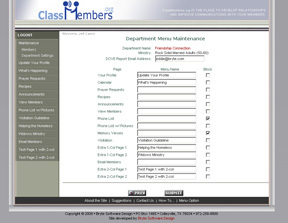 The middle column is to allow the Department Admin to type in a new name for the menu option. The checkbox on the far right will let them block any page from appearing in the department menu. At the top of the page is a place to enter email addresses if your department has been set up as a "Visiting Department". These email addresses are where the Visitation Report will be sent when it is completed and submitted.